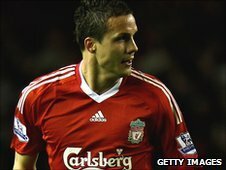 Liverpool defender Philipp Degen has joined German side VfB Stuttgart on loan for the 2010-11 season. The Swiss international, 28, was signed on a free transfer by ex-Reds boss Rafael Benitez in 2008 but played only seven times for the Anfield club. The former Borussia Dortmund full-back played under current VfB Stuttgart boss Christian Gross at Basel. "I'm looking forward to the challenge and the wonderful VfB fans," Degen told Liverpool's website. Gross said: "I know Philipp very well and rate him highly both as a football player and as a person.